Hello everyone and welcome to the next installment of our Age of Wonders III Dev Journals. My name is Daniel and I’m an Artist here at Triumph Studios. I’ve been with Triumph for more than 2 years now, working on all aspects of the environment process, from concept development to final level design. A lot has changed since the last AoW was released. We are working in full 3D now and that gives us a lot of opportunities to make the game much more immersive. For the presentation of Tactical Combat we aim to create big sweeping battles with large armies, now featuring multiple characters per unit. We really want to move away from the chessboard feel that a lot of turn based games have and make it look more like an actual battle with a better sense of scale in an epic landscape that resembles the world map location. Most importantly, our job as artists is to visually communicate gameplay events , while at the same time make things as impressive looking as we can. There are 5 unique climates: Temperate, Arctic, Blighted, Tropical and Subterranean. 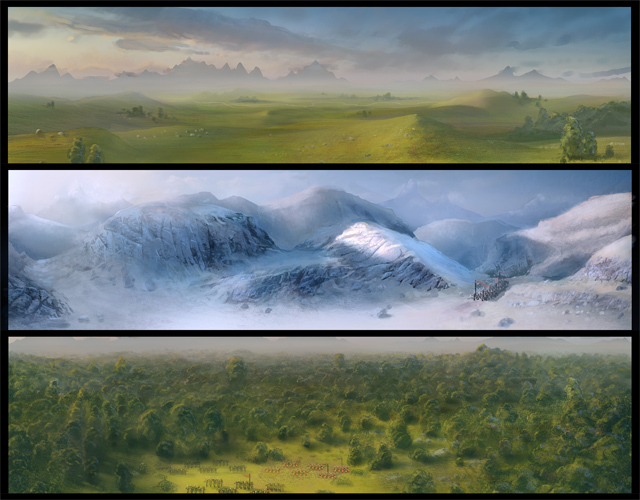 Each of these climates are made up out of a variation of terrain types: Fertile, Barren, Forests, Mountains and Swamps. On top of these climates you have a large amount of structures like Nodes, Mines, Treasure/Visit sites and of course cities for each of the races. 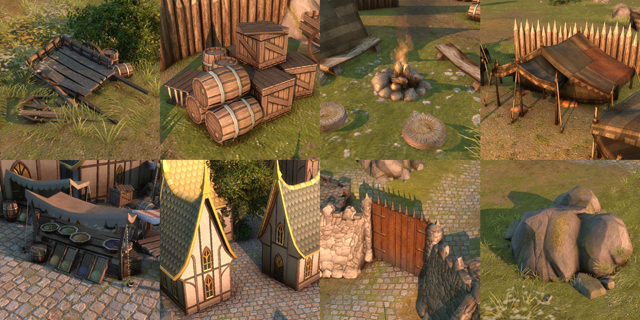 These range from small outposts to a large cities, with various upgrades including city walls. To deal with all these variables and to create unique, great looking maps, we decided to develop a partially procedurally generated system. This enables us to create tactical maps with thousands of variations and an enormous variety. The Maps are a combination of hand work, asset swapping, procedural algorithms and modular building sets. Level designers are able to pinpoint what obstacles will spawn and in which area. When entering the battlefield a random seed is generated to make the gameplay area unique but still controlled and in the proper setting. 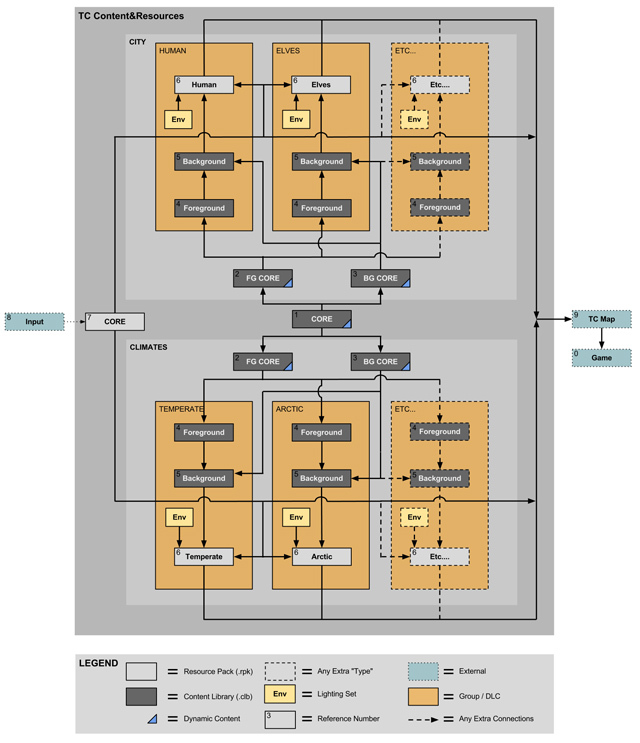 Assets are swapped across climes in order to reduce the amount of handwork in creating maps. Temples such as this one are made up out of random elements that select their source assets from controlled libraries. So there might be a limited amount of TC maps for a particular structure, but each map has randomized elements that make the experience a little different every time. Just like the old games the adjacent hexagon rule is still in place, meaning that units from nearby hexagons on the worldmap get to join a tactical battle. There are a total of 7 deployment zones in a battle. 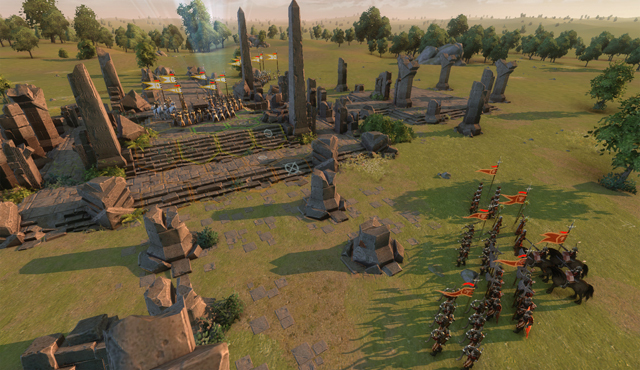 Units will spawn corresponding to the direction of the hex on the worldmap. The gameplay area currently measures 25 hexes from side to side, which is currently still being tweaked. There are hexes on all sides of the map that enable units to flee. With the worlds now being 3D, we decided to make full 360 degrees panoramas around your environment. This gives you a sense of the scale of the world and adds to the immersion. The default camera is more top down, but players are free to move the camera around similar to Total War, and you see the environment in entry/exit camera pans. 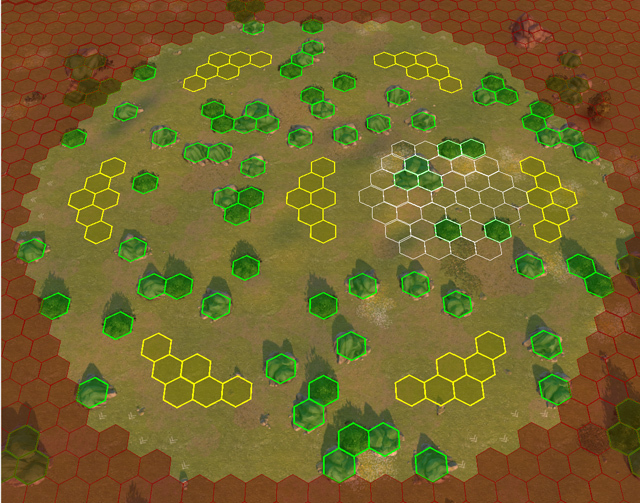 These background panoramas are dependent on the hexagons that surround the battle hex on the strategic map. So if you have an army that attacks you from the mountains, a mountain range will also show behind the attacking force on the tactical map. As there are still a lot of props like these to make, I will end my development journal here. In following dev journals we’ll be taking a closer look at the gameplay in tactical maps. This topic contains 38 replies, has 30 voices, and was last updated by zumvmy 10 months, 4 weeks ago. My jaw just hit the floor. It hurt so good. This made my week. Great work! The tactical combat in AoW sets it apart and above other games in the same genre and it looks like it will be more impressive than ever. I agree that many other turn-based games have a chessboard feel to their combat. Thanks for also sharing some of the technical considerations – I find them interesting. Were battlefields procedurally generated in the past AoW games? Wow, it’s amaizing! I just love great battles in fantasy climat and this screenshots and artwork make me feel so happy. You also wrote about low spec. Can you say how low would they be (probably it’s time to buy new computer-only for this game);P.
W You also wrote about low spec. Can you say how low would they be (probably it’s time to buy new computer-only for this game);P.
Lennart Sas : The game is not going to be a system’s hog. We’ll support a wide range of quality settings. I think a 512 MB graphics card is minimum though. We’ll post more info on this later! Thanks for info. Now I’m double happy. It’s intriguing how would as good graphics work on graphics card like that. Regards to devs. He who goes softly, goes safely and goes far. I see that you are progressing very well, will come an art opera, i’m pretty sure! 25 combo is great. Will be even possible Arctic + Swamp? Right. If I wanted to have a chessboard feel I’d play chess. … we decided to develop a partially procedurally generated system. I’m really happy to hear that. One of my biggest worries was that the battle terrain will be repetitive thus making all battles’ gameplay similar. And here we have map making skills and controlled randomness combined. Hmm… Still seems not enough to me. How big was it in AoW and AoWSM? background panoramas are dependent on the hexagons that surround the battle hex on the strategic map. Cool. Finally a game I can play maxed-out. now featuring multiple characters per unit. Multiple characters with a single health and experiance bar simply doesn’t work for me. Plus: abilities like seduce or evangelise make more sense on and against individuals than groups. It would just be like in Heroes of might and magic backwards: In HoMM you have one charakter for dozens of units. The looks don’t match the mechanics (thats very very bad). This sounds and looks great. Keep these dev journals coming. Looking forward to more in depth news on the races as well. btw, does anyone remember how many hexes a normal unit was be able to move per turn in the previous games? Looking at this picture, it looks like the selected unit can move four hexes. Is it just me or is this shorter than it used to be? Firstly the concept art is amazing, the colors and atmosphere it captures, hands down awesome. The technical with auto decal/object swapping and re-texturing is mind blowing and I’m a huge fan of the ‘background panoramas are dependent on the hexagons’ and also a fan of that stall prop! and i cant wait to hide my pike-men behind that boulder! You really can’t appreciate the code development that you don’t see will be taken for granted. Awesome. And panoramas are a cool evolution of the existing system. Remarkable. The dev diaries so far given me enormous confidence in the team working on AOWIII. Take as much time as you need, because I don’t see myself doing much else when it comes out. Yes, units used to move considerably more, and the battlefield was correspondingly bigger (in terms of individual hexes). The combat has clearly been re-scaled, with shorter movement, and this makes the map ‘effectively’ larger. Based on that scaled down movement, the size of the maps looks very good. EPIC and really inspiring!!! The care and effort being put into this game is really astonishing! I was already happy with the terrain where the actual combat is being fought being represented. To have the nearby terrain also is such an incredible detail, it adds so much to the immersion. I can see games where someone is losing the war, but suddenly ambushes someone’s army from the mountains with his/her dwarves – all with the mighty mountains in the background! There will be memorable games!!! Desert = Tropical + Barren? I hope there is an overview mode. While I realize that you want to make the game prettier than the previous ones, this should not go at the cost of tactical overview. For example: If a large model (say a Bone Dragon) stands in front of some soldiers, it may be a pain to select them with the view mode I saw in the pre-alpha trailer. The angle is too steep. I hope there will be an option to get a complete top-down view in tactical battles for the sake of controlability. For holders of powerful PC can increase the number of units in the squad by 200%. That would be closer to TOTAL WAR and the real battles. But I’m sure it’s difficult to realize. I can only dream about it. Been waiting for this for a LONG time… and I’m really impressed with the outcome so far. I’m making sure all my friends get this game; please wait until it’s perfect to release it, that’s the only way to retain gamers and improve the online play. What release date are you shooting for? Looks good, but I hope you’ll make the battlefield just a bit bigger, to make ranged warfare more strategic, and allow more maneuvering. I must say I prefer the 1 unit pieces myself; seems like this will tax the system for larger battles.